static const char ComboExTestClass  = "ComboExTestClass"
Definition at line 34 of file combo.c. Definition at line 33 of file combo.c. Definition at line 30 of file combo.c. Definition at line 36 of file combo.c. Definition at line 38 of file combo.c. Definition at line 51 of file combo.c. Definition at line 31 of file combo.c. Definition at line 70 of file combo.c. Referenced by test_comboex(), and test_comboex_CB_GETLBTEXT(). Definition at line 522 of file combo.c. Definition at line 994 of file combo.c. Definition at line 443 of file combo.c. Definition at line 467 of file combo.c. Definition at line 607 of file combo.c. Referenced by test_combo_changesize(), test_combo_editselection(), test_combo_editselection_focus(), test_combo_listbox_styles(), test_combo_setfont(), test_combo_setitemheight(), test_combo_WS_VSCROLL(), and test_selection(). Definition at line 65 of file combo.c. 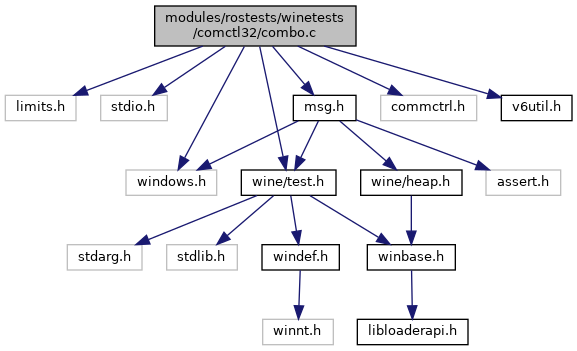 Referenced by test_comboex(), test_comboex_CB_GETLBTEXT(), test_comboex_get_set_item(), test_comboex_subclass(), and test_comboex_WM_WINDOWPOSCHANGING(). Definition at line 90 of file combo.c. Definition at line 103 of file combo.c. Definition at line 612 of file combo.c. Referenced by GdipGetFontHeight(), get_font_hfont(), OleCreatePropertyFrameIndirect(), test_combo_setfont(), test_combo_setitemheight(), test_font_height_scaling(), test_GetConsoleFontSize(), and test_GetTextMetrics2(). Definition at line 56 of file combo.c. Referenced by test_combo_editselection(), test_combo_editselection_focus(), test_combo_listbox_styles(), test_combo_WS_VSCROLL(), and test_comboex_WM_LBUTTONDOWN(). Definition at line 94 of file combo.c. Definition at line 494 of file combo.c. Definition at line 483 of file combo.c. Definition at line 721 of file combo.c. Definition at line 80 of file combo.c. Definition at line 1257 of file combo.c. Definition at line 134 of file combo.c. Definition at line 810 of file combo.c. Definition at line 821 of file combo.c. Definition at line 1154 of file combo.c. Definition at line 899 of file combo.c. Definition at line 1026 of file combo.c. Definition at line 1079 of file combo.c. Definition at line 649 of file combo.c. Definition at line 627 of file combo.c. Definition at line 1123 of file combo.c. Definition at line 147 of file combo.c. Definition at line 361 of file combo.c. Definition at line 565 of file combo.c. Definition at line 538 of file combo.c. Definition at line 250 of file combo.c. Definition at line 396 of file combo.c. Definition at line 756 of file combo.c. Definition at line 1004 of file combo.c. const char ComboExTestClass = "ComboExTestClass"
Definition at line 47 of file combo.c. Referenced by cleanup(), and init(). Definition at line 49 of file combo.c. Definition at line 990 of file combo.c. Referenced by combobox_subclass_proc(), and test_combo_editselection_focus(). Definition at line 717 of file combo.c. Referenced by parent_wnd_proc(), and test_selection(). Definition at line 718 of file combo.c. Definition at line 992 of file combo.c. Referenced by test_combo_editselection_focus(), and test_window_proc(). Definition at line 45 of file combo.c. Referenced by cleanup(), createComboEx(), init(), and test_comboex_WM_LBUTTONDOWN(). Definition at line 46 of file combo.c. Referenced by createComboEx(), init(), and test_comboex_WM_LBUTTONDOWN(). Referenced by cleanup(), create_combobox(), init(), test_combo_dropdown_size(), test_combo_editselection_focus(), test_combo_setfont(), test_combo_setitemheight(), and test_selection(). Definition at line 716 of file combo.c. Referenced by ToolTip::add(), button_hook_proc(), button_subclass_proc(), callwndproc_proc(), CBTProc(), cd_wndproc(), child_proc(), ChildWndProc(), clipbrd_wndproc(), CommonPropertySheetUIA(), CommonPropertySheetUIW(), connections_dlgproc(), connections_on_notify(), content_dlgproc(), DesktopBar::ControlResize(), cowait_window_proc(), ctrl_container_wndproc(), CtxMenu_HandleMenuMsg(), datetime_subclass_proc(), dde_msg_client_wndproc(), dde_server_wndproc(), dde_server_wndprocA(), dde_server_wndprocW(), DECLARE_INTERFACE_(), def_window_procA(), def_window_procW(), DestinationDlgProc(), destroy_dialog_owner_proc(), device_process_message(), Window::DialogProc(), PropSheetPageDlg::DialogProc(), dinput_mouse_hook(), dlgproc_addport(), dlgproc_lptconfig(), drop_window_proc(), dropdown_subclass_proc(), edit_dialog_proc(), edit_singleline_dialog_proc(), edit_subclass_proc(), edit_wantreturn_dialog_proc(), editbox_subclass_proc(), empty_dlg_proc2(), enum_all_fonts_proc(), enum_fonts_proc(), File::enum_lines(), enum_locale_ex_proc(), enum_with_magic_retval_proc(), EnumResourceLanguagesA(), EnumResourceLanguagesW(), EnumResourceNamesA(), EnumResourceNamesW(), EnumResourceTypesA(), EnumResourceTypesW(), EnumSystemLocalesEx(), TaskBar::EnumWndProc(), EnumWndProc(), FilterDialogDlgProc(), find_window_callback(), fnTextSrv_TxSendMessage(), font_enum_proc(), FrameWndProc(), general_dlgproc(), general_on_notify(), get_available_monitors_proc(), GetWindowModulePathCopyData(), handle_internal_message(), CtxMenuInterfaces::HandleMenuMsg(), header_subclass_proc(), hook_dde_client_wndprocA(), hook_dde_client_wndprocW(), hyperlink_dlgproc(), icm_choose_compressor_dlgproc(), ie_dialog_open_proc(), ie_window_proc(), iewnd_OnCommand(), iewnd_OnNotify(), imm_wnd_proc(), init_test_message(), itemdlg_dlgproc(), KeyboardCallback(), FindProgramDlg::LaunchSelected(), LCMapStringEx(), linedda_callback(), listbox_wnd_proc(), listview_subclass_proc(), LL_hook_proc(), long_enum_proc(), main_window_proc(), main_window_procA(), main_window_procW(), mdi_child_wnd_proc_1(), mdi_child_wnd_proc_2(), mdi_main_wnd_procA(), Window::MDICBTHookProc(), menu_cancelmode_wnd_proc(), menu_check_wnd_proc(), menu_fill_in_init(), menu_ownerdraw_wnd_proc(), menu_track_again_wnd_proc(), MinimizeDesktopEnumFct(), NotifyHook::ModulePathCopyData(), monitor_enum_proc(), monthcal_subclass_proc(), mstsc_mousewheel(), mstsc_WndProc(), multi_edit_dialog_proc(), nav_page_proc(), nccalcsize_proc(), MainFrameBase::Notify(), NotifyHookProc(), notifysink_on_tvn_dropdown(), notifysink_on_wm_notify(), notifysink_proc(), on_command_filetype(), on_command_opendropdown(), on_wm_command(), on_wm_getminmaxinfo(), page_dlg_proc(), pager_subclass_proc(), pagesetup_margin_editproc(), parent_dlg_proc(), parent_wnd_proc(), parentdc_window_procA(), post_quit_dialog_owner_proc(), Window::PostParent(), proc_window(), MainFrameBase::ProcessMessage(), prompt_dlgproc(), PropertiesDialogDlgProc(), property_sheet_proc(), propsheet_callback(), Window::PropSheetCBTHookProc(), radiobuttonlist_on_wm_command(), radiobuttonlist_proc(), redraw_window_procA(), reparent_dialog_owner_proc(), reparent_dlg_proc(), reparent_owned_dlg_proc(), run_test(), run_test_(), save_message(), ScreenSaverProc(), scroll_init_proc(), security_dlgproc(), security_on_notify(), Window::SendParent(), sheet_callback(), SIC_CompareEntries(), smresult_wndproc(), StyleCheckProc(), SubclassedWindow::SubclassedWndProc(), subpopuplocked_wnd_proc(), SwitchDesktopEnumFct(), syslink_subclass_proc(), tab_subclass_proc(), taskdialog_notify(), test_aw_conversion_dlgproc3(), test_aw_conversion_dlgprocA(), test_aw_conversion_dlgprocW(), test_aw_conversion_wndproc(), test_control_procA(), test_customize_dlgproc(), test_getset_item(), test_msg_client(), test_PackDDElParam(), test_parent_wndproc(), test_TCS_OWNERDRAWFIXED(), test_thick_child_size_winproc(), test_window_proc(), testwindow_wndproc(), tool_window_procA(), trackbar_subclass_proc(), TreeviewWndProc(), TreeWndProc(), unpack_dde_message(), update_addrbar(), updown_subclass_proc(), userselect_dlgproc(), warning_proc(), window_proc(), Window::WindowWndProc(), wined3d_wndproc(), winproc(), winproc_convA(), winproc_convW(), BackgroundWindow::WndProc(), WndProc(), QuickLaunchBar::WndProc(), MainFrameBase::WndProc(), DesktopWindow::WndProc(), TaskBar::WndProc(), FileChildWindow::WndProc(), FindProgramDlg::WndProc(), StartMenuButton::WndProc(), DesktopBar::WndProc(), Pane::WndProc(), Window::WndProc(), MDIMainFrame::WndProc(), ExecuteDialog::WndProc(), StartButton::WndProc(), NotifyArea::WndProc(), SDIMainFrame::WndProc(), DesktopShellView::WndProc(), SubclassedWindow::WndProc(), ShellBrowserChildT< MainFrameBase >::WndProc(), StartMenu::WndProc(), TrayNotifyDlg::WndProc(), ClockWindow::WndProc(), MDIShellBrowserChild::WndProc(), ChildWindow::WndProc(), IPCtrlWindow< ChildWindow, SIfacePtr< IWebBrowser2 > >::WndProc(), StartMenuRoot::WndProc(), ResizeController< Dialog >::WndProc(), CtlColorParent< OwnerDrawParent< Dialog > >::WndProc(), OwnerDrawParent< Dialog >::WndProc(), OwnerdrawnButton::WndProc(), FlatButton::WndProc(), ColorStatic::WndProc(), HyperlinkCtrl::WndProc(), ExplorerAboutDlg::WndProc(), WebChildWindow::WndProc(), TrayIconControllerTemplate< BASE >::WndProc(), EditController::WndProc(), ExtContextMenuHandlerT< ShellBrowserChildT< ChildWindow > >::WndProc(), and ws2_test_WndProc(). Referenced by cleanup(), COMBO_ItemOp(), combobox_subclass_proc(), ComboExTestWndProc(), editbox_subclass_proc(), parent_wnd_proc(), and test_window_proc(). Definition at line 54 of file combo.c. Referenced by ComboExTestOnNotify(), and test_comboex_WM_LBUTTONDOWN(). Definition at line 719 of file combo.c. Definition at line 43 of file combo.c. Referenced by editbox_subclass_proc(), START_TEST(), and test_comboex_get_set_item(). Definition at line 991 of file combo.c. Definition at line 558 of file combo.c. Definition at line 52 of file combo.c. Referenced by CDockSite::Exec(), getItem(), CDockSite::Initialize(), and test_comboex(). Referenced by AboutProc(), button_hook_proc(), button_subclass_proc(), callwndproc_proc(), CBTProc(), cd_wndproc(), child_proc(), ChildWndProc(), clipbrd_wndproc(), connections_dlgproc(), connections_on_command(), content_dlgproc(), DesktopBar::ControlResize(), cowait_window_proc(), ctrl_container_wndproc(), CtxMenu_HandleMenuMsg(), d3drm_device_win_HandleActivate(), datetime_subclass_proc(), dde_msg_client_wndproc(), dde_server_wndproc(), dde_server_wndprocA(), dde_server_wndprocW(), DECLARE_INTERFACE_(), def_window_procA(), def_window_procW(), delhist_dlgproc(), delhist_on_command(), DestinationDlgProc(), destroy_dialog_owner_proc(), device_process_message(), Window::DialogProc(), PropSheetPageDlg::DialogProc(), dinput_mouse_hook(), dlgproc_addport(), dlgproc_lptconfig(), drop_window_proc(), dropdown_subclass_proc(), edit_dialog_proc(), edit_singleline_dialog_proc(), edit_subclass_proc(), edit_wantreturn_dialog_proc(), editbox_subclass_proc(), FilterDialogDlgProc(), fnTextSrv_TxSendMessage(), FrameWndProc(), general_dlgproc(), general_on_command(), general_on_notify(), handle_internal_message(), CtxMenuInterfaces::HandleMenuMsg(), header_subclass_proc(), hook_dde_client_wndprocA(), hook_dde_client_wndprocW(), hyperlink_dlgproc(), icm_choose_compressor_dlgproc(), ie_dialog_open_proc(), ie_window_proc(), iewnd_OnCommand(), imm_wnd_proc(), init_test_message(), itemdlg_dlgproc(), KeyboardCallback(), listbox_wnd_proc(), listview_subclass_proc(), LL_hook_proc(), main_window_proc(), main_window_procA(), main_window_procW(), map_wparam_AtoW(), mdi_child_wnd_proc_1(), mdi_child_wnd_proc_2(), mdi_main_wnd_procA(), Window::MDICBTHookProc(), menu_cancelmode_wnd_proc(), menu_check_wnd_proc(), menu_fill_in_init(), menu_ownerdraw_wnd_proc(), menu_track_again_wnd_proc(), monthcal_subclass_proc(), mstsc_WndProc(), multi_edit_dialog_proc(), NC_HandleNCCalcSize(), nccalcsize_proc(), NotifyHookProc(), notifysink_on_bn_clicked(), notifysink_on_cbn_selchange(), notifysink_on_wm_command(), notifysink_proc(), on_command_filetype(), on_command_opendropdown(), on_wm_command(), page_with_custom_default_button_dlg_proc(), pager_subclass_proc(), pagesetup_margin_editproc(), parent_wnd_proc(), parentdc_window_procA(), post_quit_dialog_owner_proc(), Window::PostParent(), proc_window(), MainFrameBase::ProcessMessage(), prompt_dlgproc(), PropertiesDialogDlgProc(), Window::PropSheetCBTHookProc(), radiobuttonlist_on_wm_command(), radiobuttonlist_proc(), redraw_window_procA(), reparent_dialog_owner_proc(), run_test(), run_test_(), save_message(), ScreenSaverConfigureDialog(), ScreenSaverProc(), scroll_init_proc(), security_dlgproc(), security_on_notify(), Window::SendParent(), ShutdownGuiProc(), smresult_wndproc(), StyleCheckProc(), SubclassedWindow::SubclassedWndProc(), subpopuplocked_wnd_proc(), syslink_subclass_proc(), tab_subclass_proc(), taskdialog_notify(), test_aw_conversion_dlgprocA(), test_aw_conversion_dlgprocW(), test_aw_conversion_wndproc(), test_control_procA(), test_customize_dlgproc(), test_parent_wndproc(), test_thick_child_size_winproc(), test_window_proc(), testwindow_wndproc(), timer_message_dlg_proc(), tool_window_procA(), trackbar_subclass_proc(), TreeviewWndProc(), TreeWndProc(), updown_subclass_proc(), userselect_dlgproc(), warning_proc(), window_proc(), Window::WindowWndProc(), wined3d_wndproc(), winproc_convA(), winproc_convW(), BackgroundWindow::WndProc(), WndProc(), QuickLaunchBar::WndProc(), MainFrameBase::WndProc(), DesktopWindow::WndProc(), TaskBar::WndProc(), FileChildWindow::WndProc(), FindProgramDlg::WndProc(), StartMenuButton::WndProc(), DesktopBar::WndProc(), Pane::WndProc(), Window::WndProc(), MDIMainFrame::WndProc(), ExecuteDialog::WndProc(), StartButton::WndProc(), NotifyArea::WndProc(), SDIMainFrame::WndProc(), DesktopShellView::WndProc(), SubclassedWindow::WndProc(), ShellBrowserChildT< MainFrameBase >::WndProc(), StartMenu::WndProc(), TrayNotifyDlg::WndProc(), ClockWindow::WndProc(), MDIShellBrowserChild::WndProc(), ChildWindow::WndProc(), IPCtrlWindow< ChildWindow, SIfacePtr< IWebBrowser2 > >::WndProc(), StartMenuRoot::WndProc(), ResizeController< Dialog >::WndProc(), CtlColorParent< OwnerDrawParent< Dialog > >::WndProc(), OwnerDrawParent< Dialog >::WndProc(), OwnerdrawnButton::WndProc(), FlatButton::WndProc(), ColorStatic::WndProc(), HyperlinkCtrl::WndProc(), ExplorerAboutDlg::WndProc(), WebChildWindow::WndProc(), TrayIconControllerTemplate< BASE >::WndProc(), EditController::WndProc(), ExtContextMenuHandlerT< ShellBrowserChildT< ChildWindow > >::WndProc(), and ws2_test_WndProc().